I love to talk, put me on a stage and you can’t get me down with the proverbial gun. 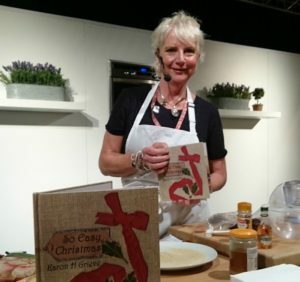 I’ve been doing cookery demonstrations for Country Living Magazine Christmas Fairs since 2010, making everything from liqueurs to party food, sugar free treats to tattie scones. Getting the audience involved is one of my favourite things, making sure you can get enough humour into your demonstration as possible really helps people to remember what you are talking about and keeps their interest. 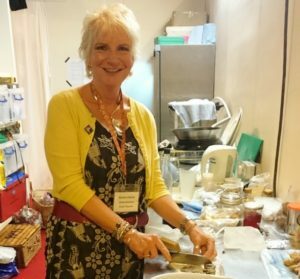 I’ve also done cooking demonstrations for Edinburgh Foodies Festivals, Gardening Scotland Show, Scottish Food & Drink Show, Wigton and Balloch Foodie Festival and Scottish Homes and Interiors Shows. For Country Living Magazine Christmas Fairs I also teach craft classes with 50 participants in each group. I’ve made scenty snowballs, fragrant Christmas wreaths, pretty fabric flowers and mini Christmas trees to name just a few of the crafty items I’ve had people make to take home. It’s fun to be doing something really hands-on with people and hopping off the stage to go around the class helping the participants to get to grips with something they may be completely unfamiliar with and enjoying their pleasure at the end when they have mastered a new craft. Talks are another of my ‘things’ as I’ve already said, I do regular talks in the Lifestyle Theatre for Country Living covering everything from home fragrance to gift wrapping, preparing for Christmas to making your own handmade gifts. It’s not just big venues that interest me, I am also a regular speaker and demonstrator for the SWRI (Scottish Womans Rural Institute) covering venues all over Ayrshire, Renfrewshire and even the beautiful Isle of Bute. I also do talks for gardening clubs as well. I used to have a regular spot on Scottish Television’s The Hour show where I was their herbs and homecrafts expert and made all sorts of herbal goodies from air fresheners to love potions (now that was a scream with Colin and Justin as my co-hosts – see it on You Tube if you really want a laugh) live on air. Since 2010 I have worked as home economist and foodie expert for BBC Radio Scotland. In 2017 I was a finalist on Kirstie’s Handmade Christmas television show for Channel 4 which was great fun. If you are interested in having me do a cooking demo or talk for your club or group please don’t hesitate to contact me for rates etc.